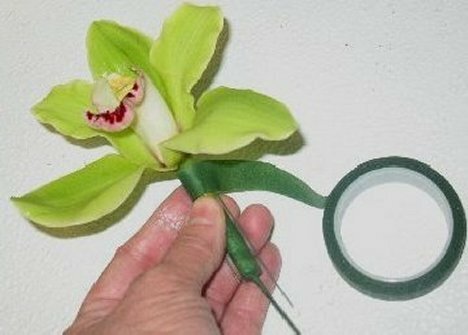 To make a corsage from a cymbidium order takes a little different approach than other flower varieties. 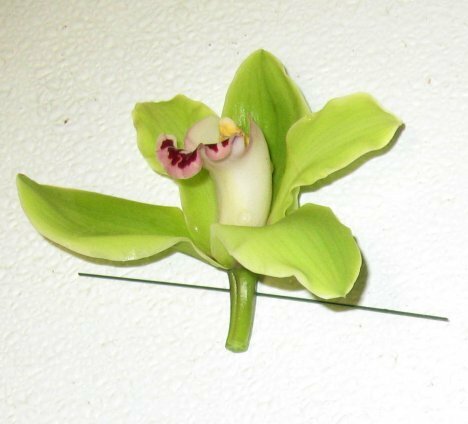 Cymbidiums are a lush tropical, with a heavy waxy feel to the petals. They hold up well in bouquets and corsages. 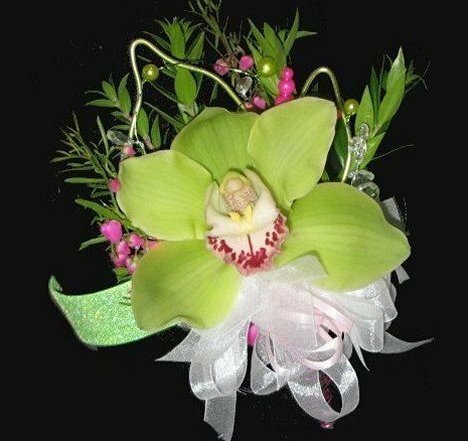 If you plan to do an entire wedding, consider ordering your orchids by the stem rather than individually. It is more cost effective and you can sort out blooms, laying aside smaller ones for smaller people. 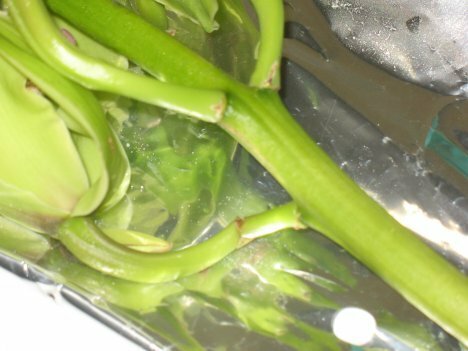 The cymbidiums arrive in a protective plastic sleeve with an attached water tube at the bottom of the cut stem. 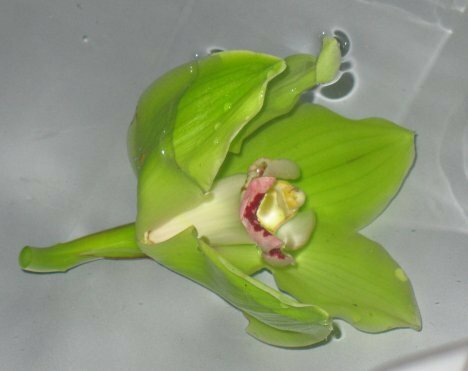 Be careful as you slit the plastic open not to damage any of the petals of the orchids. 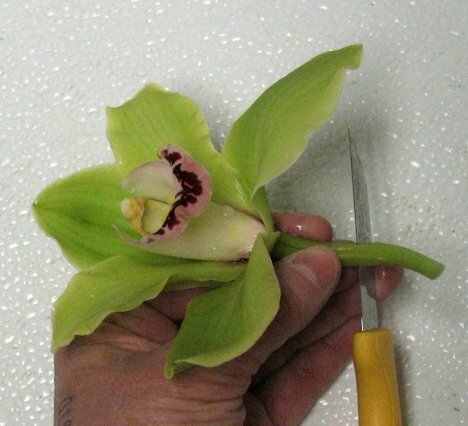 Cut each cymbidium bloom off individually where the laterals meet the regular stem of the entire flower. 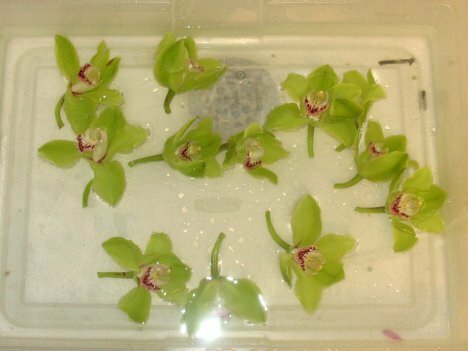 Immediately submerge the flower head into a tray of tepid water. These flowers are tropical and love to be refreshed with a light soak. 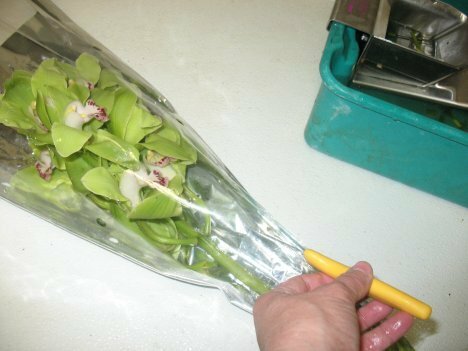 Be sure the freshly cut end is UNDER the water so no air is drawn up into the flower head. I cut off all my blooms at once and give them all a quick bath before designing the corsage. 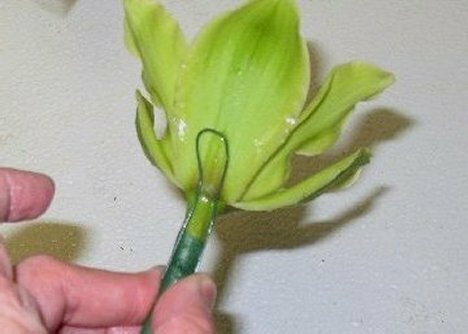 Using a sharp knife, make a short, straight blunt cut at the flower stem. 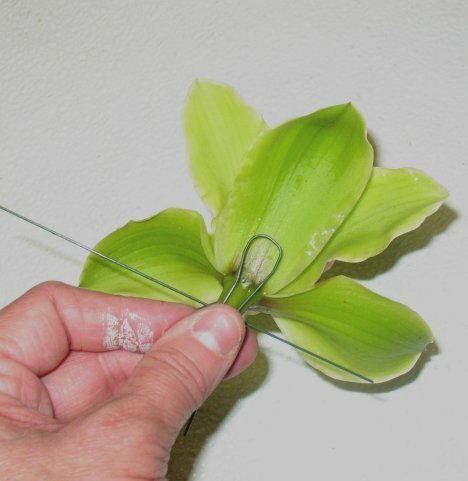 For additional support, I insert a 26 gauge green florist wire laterally across the stem. 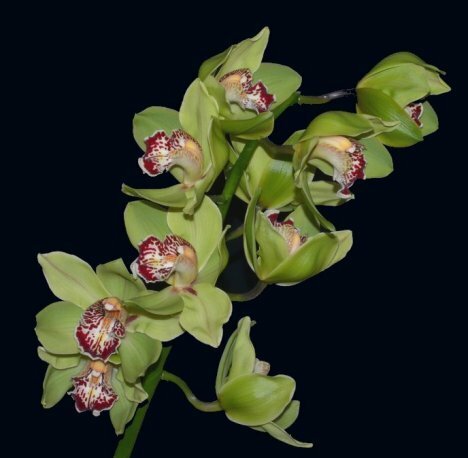 You may need to add extra support to the back of the flower heads like these orchids. 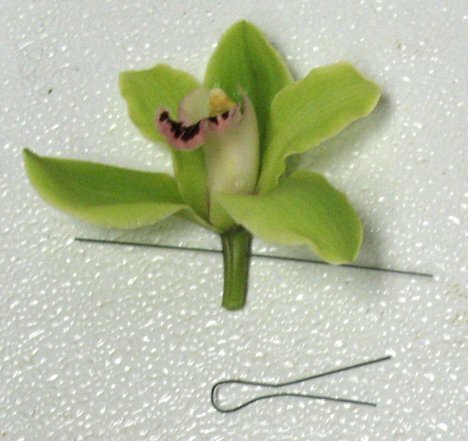 Simply bend a piece of florist wire into a hairpin shape. 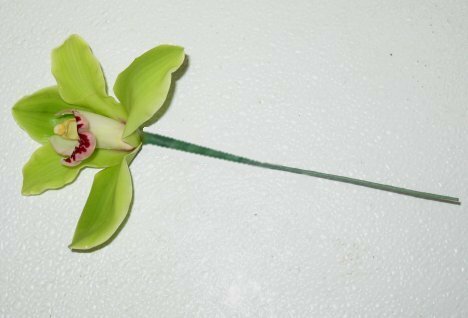 Press this shaped wire against the back of the flower, bending slightly backwards to follow the curve of the heavy petals. Tape into place with florist tape. This step is simple meant for added support. Some professionals skip this step. I like to give the flowers all the support they need, so I often take this extra step. Here I taped down the stem after bending down the 26 gauge wire. I tape all down the stem, concealing the bare wire. Pull down at an angle as you tape. 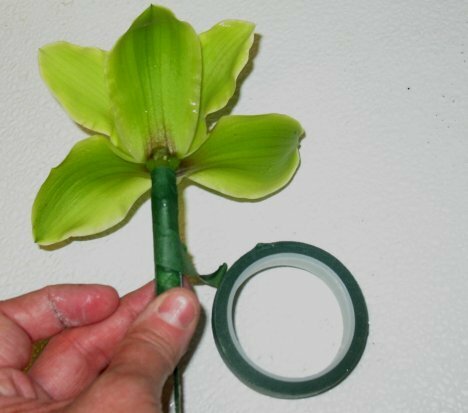 Tear off when you reach the bottom and twist tightly to seal the torn end against the stem. You can either coil the long wire up in a decorative spiral or cut off to finish the stem in a different way. It's a matter of personal choice. If you coil it, wrap the long stem around a pencil or screwdriver shank to get even coils.